Samdi Bamboo Made Tray / Dock /Bracket / Platform for Bluetooth Apple Magic Keyboard with Number Pad : allputer.com - Accessories for all your Portable Electronics & Computers! 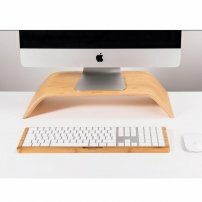 This sleek keyboard tray made from Bamboo, simply slide in your Apple Magic wireless keyboard with numeric key pad then all rested. Keep stylist and being minimalism. - Package Weight: 400g approx.